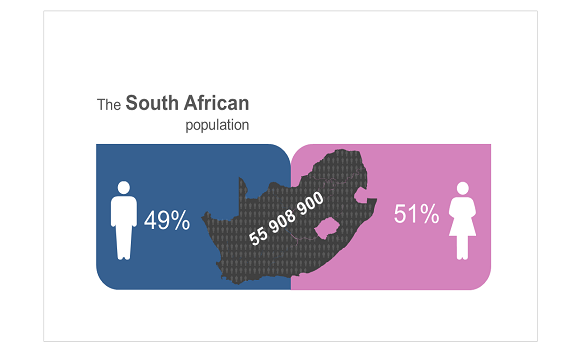 The population of South Africa is estimated to be 55, 9 million by end June 2016. Between 2002 and 2016 South Africa experienced a positive population growth year on year. Between 2002 and 2016, there was an overall increase in Life expectancy (55,2 to 62,4 years) and a decline in Infant (48,2 to 33,7 deaths per 1000 live births) and under 5 mortality rate (70,8 to 44,1 deaths per 1000 live births). A third of the population is estimated to be under the age of 15, whilst 8% of the population is aged of 60 and over. South Africa is one of the few developing countries experiencing an increase in the proportion aged 60 and over from 6,61% in 2002 to 8,01% in 2016. Declining population growth rates year on year among young people aged 15-34 in conjunction with increasing growth rates among elderly aged 60+ indicates that South Africa’s population is Ageing. With a decline in TFR over time and increased life expectancy, South Africa is expected to experience a continued increase in Old age dependency. Of those elderly aged 60 years and older, the highest percentage 26,1% (1,17 million) reside in Gauteng. In Northern Cape nearly 10% of the population are elderly. The growing proportion of elderly in South Africa will bring new challenges that needs to be addressed. Aging populations often experience old age dependency, social and economic vulnerability and increased strain on health and social care. Improved access and uptake of ARVs over time in the public and private sector in South Africa has enabled HIV positive people to live longer and healthy lives, resulting in gradual decline in AIDS related deaths between 2006 (48%) and 2016 (28%). Despite the gains recently made in the fight against the HIV/AIDS pandemic i.e. reduced AIDS related deaths and declining HIV incidence rates, South Africa has paid a large price. In conjunction with losing economically active adults due to HIV/ AIDS deaths which impacts negatively on the demographic dividend, older people are burdened with caring for younger people who are sick or dying of AIDS, burying their children and breadwinners whilst caring for grandchildren. By 2016 it is estimated 7 million people are HIV positive. A large proportion of South Africans are growing old either infected or affected by HIV and AIDS. Future considerations regarding the provision of health care for a growing HIV population across all ages is paramount. The Demographic and Health Survey 2016 will highlight older people’s challenges to healthy living but also burdens they may face in day to day living.